Swedish Hard Rock never stopped with the band EUROPE, it's not all about "The Final Countdown". It all began back in 1987 when Sweden didn't know that one of their biggest Sleaze / Rock N’ Roll legends will pop out of Malmo. NASTY IDOLS started in Sweden what PRETTY BOY FLOYD did in the U.S.A but with a little more attitude and ballsy music. Back in the days when Metal ruled the world providing the chance to watch the real deal on MTV’s Headbanger’s Ball, NASTY IDOLS videos weren't a matter of question, especially if they were going to be played on the night’s show. Their breakthrough supplied them with a worldwide expose from Europe to Asia. The band kept rocking by the hands of their leader Andy Pierce until its breakup in 1995 due to the rise of the Grunge genre that hit the Glam Metal scene all over the world. At 2006 the band re-united and had a successful concert at the Sweden Rock Festival, which opened the door for them once again. Now they released their 6th new album "Kalifornia" that contains 80's Metal spirit that would lead you back to the past, as if the present never existed. The album opens with the track "No More Rules", a typical Glam Metal riffing for the genre in the veins of L.A. Glam bands that reminded me a lot of the TIGERTAILZ stuff. 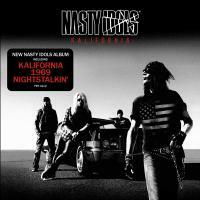 The self title track "Kalifornia" delivered a good into, starting with a redneck / Southern oriented singing style and turning to heavier Hard Rock melodies. This is Glam Metal with a boost, has that fine Rock N’ Roll atmosphere but even dirtier. The guitar solo provides us additional shred licks which makes it unique and evil like the molesting singing rhythms of "We All Gonna Die". Another hit single is "Night By Night", Hard N’ Heavy song that started with a tension and showed the Heavy Metal side of NASTY IDOLS. The song is catchy and with a sing along chorus that won't leave anybody just standing without head banging. "Sister Sin" really reminded me PRETTY BOY FLOYD mix with MOTLEY CRUE’s early stuff. I couldn't believe it's a new song. Unfortunately in general there wasn't any special thing here, it's a typical Rock N’ Roll formula but the song got good vibe and lots of fun in it especially when the chorus is backed only with the drums in the middle, which meant to give it an additional drive. I found the song "Pleasure Of The Pain" as the best song around, the killer chorus is doing the whole work, I must recommend the good the awesome drumming work of Rikki Dahl with his interesting breaks through the song. "Roadtrip" is another great track, little bit darker and heavier than the rest of the songs, especially because the pre chorus part which shows that it’s one of a kind. Through the end of the album the songs are getting better, another sticky track is "Sweet Suicide", very tight song with the rhythmic guitar the set the base to the song. Andy shows his sleazier singing end, rougher, dirtier and in your face. I would like to spell a good light once more on Peter Espinoza'sguitar work through the song "Jack In The Box" that will slice your heart into 2 pieces, the solo presents the it can be done differently than what we used to know so far in the Glam Metal guitar solos. "Kalifornia" brings a fresh sound with good memories from the sunset strip area, it has rudeness, uncompromised and with balls.